Maryland State Police at McHenry Barrack have confirmed that the aircraft seen on the Beltway was a military airplane being moved from West Virginia to the Patuxent River Naval Air Station in southern Maryland. 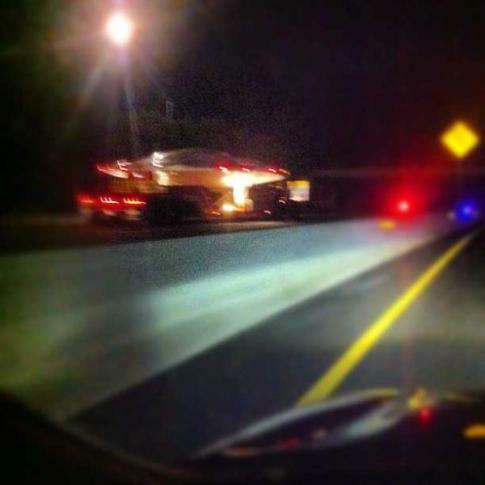 WASHINGTON – Did you see the UFO on the Beltway? Twitter exploded late Wednesday evening with reports and photos that a UFO landed on the Capital Beltway near College Park. Construction at Kenilworth Avenue had traffic backed up, which escalated concerns that something big was happening. Maryland State Police at the McHenry Barrack have confirmed the aircraft seen on the Beltway was a military airplane being moved from West Virginia to Naval Air Station Patuxent River in Southern Maryland. The plane is 82 feet long, 32 feet wide and 14 feet high. The X-46B is the same type of military vehicle that crashed earlier this week near Salisbury, Md. This isn’t the first time an aircraft like this has been confused for a UFO. Check out the video below from military.com of a similar craft in Kansas. Defense Tech reports the one below also was headed to Naval Air Station Patuxent River. What did you see? Use #beltwayufo. WTOP’s Michelle Basch and Lacey Mason contributed to this report. Follow Michelle , Lacey and WTOP on Twitter.